Blood Assurance will be awarding Shaw Industries Plant 15 as the Top Manufacturing Facility in Collections for 2018 on Tuesday, April 30 from 10:30 a.m. - 11:30 a.m. at Shaw Plant 15 off Highway 411 in Cartersville. With a total of 452 units collected for the year, Shaw Pant 15 has experienced a nearly 400% growth in collections over 2017 under blood drive coordinator, Julie Knight, Shaw Plant 15 assistant scheduling manager at Plant 15. 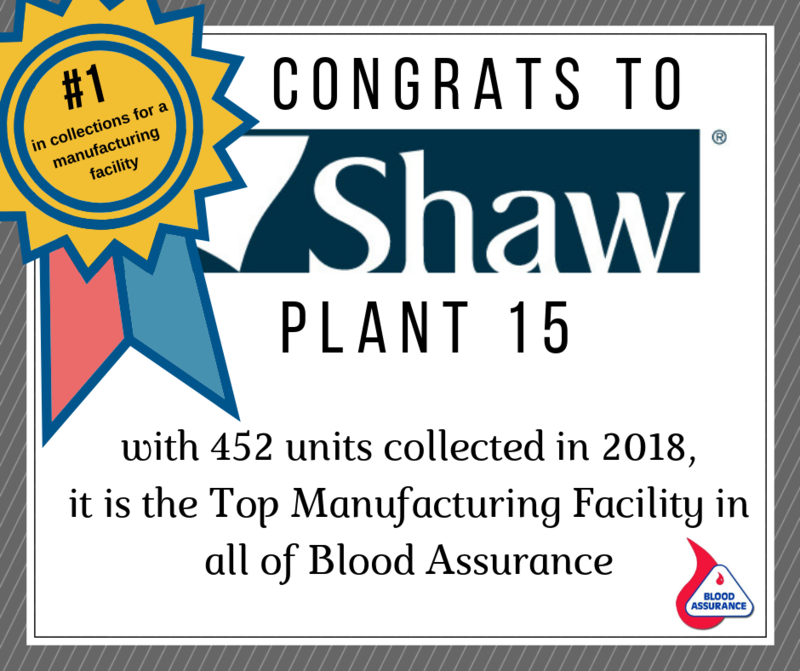 These efforts have made Shaw Plant 15 the number one manufacturing facility for collections in all of the entire 5-state territory of Blood Assurance for 2018. WHEN: Tuesday, April 30 from 10:30 a.m. - 11:30 a.m.
WHY: With 452 units collected in 2018, Shaw Plant 15 is the Top Manufacturing Facility in Collections for all of Blood Assurance. Blood drive coordinator, Julie Knight, Shaw Plant 15 assistant scheduling manager, and her blood drive team as well as Shaw Plant 15 management, associates and donors need to be commended and honored for this accomplishment. Blood Assurance's Executive Director of Operations for North Georgia, Brian McDaniel, Account Manager, Terra Moorehead, and Community Liaison, Mandy Perry, will be available to answer any questions or give interviews. As well as Deanna Mathis, Shaw Industries director of community outreach and corporate giving, and Brenda Ratcliff, Shaw Industries medical services manager. For more information or for news organizations interested in covering this event, please contact Mandy Perry at mandyperry@bloodassurance.org or 678-231-9799. Tuesday, April 30, 2019 from 10:30 a.m. - 11:30 a.m.